Guardian Theater critic Lyn Gardner doesn’t hide her contempt for the Jewish state, and seems to possess a rather large blind spot when it comes to antisemitism. Her Guardian 2009 year-end review, “The year in theater: Lyn Gardner’s best of 2009″, included, in the category of “Things to celebrate”, Caryl Churchill’s hideous play, Seven Jewish Children. Three of the six passages in Gardner’s May 29th Guardian review of the performance, by Israel’s National Habima Theater, of ‘Merchant of Venice’ (at The Globe in London) was devoted, in some manner, to Palestinians or pro-Palestinian activists who seek the exclusion of Israeli artists. No, of course I don’t expect Gardner to see Shylock and think of the 900,000 indigenous Jews displaced from Arab lands following Israel’s rebirth in 1948, but her passage did cause me to wonder about the following: In the context of the Globe’s Shakespeare Festival (37 plays in 37 languages), which includes plays in, for instance, Turkish, Mandarin, and Urdu (the language of Pakistan), did her mind drift to the national aspirations of the Kurds in Turkey, the ethnically cleansed Tibetans, or the millions of Hindus and Sikhs displaced by Pakistan’s independence? Moreover, no doubt, Lyn Gardner would insist it’s the Jewish state she objects to, and not Jews as such. Yet, remember, Gardner was not only undisturbed by Carly Churchill’s Judeophobic agitprop – a work of “art” possessing tropes impugning the very essence of a people and its faith – but, indeed, celebrated the play as a theatric tour de force. Similarly, in Gardner’s take on a Jewish performance of ‘Merchant of Venice’ (in Hebrew) which, as David Hirsh explained, is, in part, a “story of Shylock, a Jewish money-lender who is spat on, excluded, beaten up, and in the end mercilessly defeated and humiliated”, evokes not, for her, the ugly spectacle of antisemitic abuse, nor the antisemitic stereotype represented by Shylock himself, but, rather, the plight of “displaced Palestinians”. When Jews are pricked it is Palestinians who, in the eyes of many within the British “intelligentsia” and “cultured” class, now bleed. 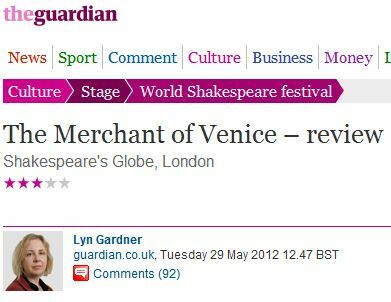 Seems to me that in Lyn Gardner’s and the Guardian’s world things like the the artistic value of the performance, the play, the actors are merely some redundant and indifferent subjects in a theatrical review. The only important thing is some Jew/Israel bashing. This is natural and self explanatory: A Jew-hater celebrates a fellow traveller. As long as the Governement of Israel chooses to maintain its occupation of the Palestinian territory (West Bank, East Jerusalem, Gaza) and its settlement policy, criticism of Israel will be widespread, including among the Diaspora. In Western democracies, peoples have long ceased to occupy other peoples. 1.) Israel does not occupy Gaza. 2.) What could be termed as the occupation of the West Bank and East Jerusalem is in accordance with the Oslo Accords to which the Palestinian Authority has signed on to. Oh Adam you are such a cry baby. I don’t know how you would ever get through the day if you were Irish. Why would being Irish be a burden, or handicap, for Adam or anyone else? The Guardian is a national newspaper. It doesn’t just serve the Jewish community. Demonstrations at artistic events, are, by dint of their rarity, newsworthy. There’s no big conspiracy here! Correct Alex. The Guardian is a British national newspaper and it really doesn’t serve the Jewish community but the anti-American, “anti-Zionist” (mean anti-Jewish) trash of the UK. Demonstrations at artistic events, are, by dint of their rarity, newsworthy. The Guardian is a British national newspaper and it really doesn’t serve the Jewish community but the anti-American, “anti-Zionist” (mean anti-Jewish) trash of the UK. What a load of deluded nonsense. And you accuse another poster of having an “ant-sized brain”?!?! Was Shylock really Palestinian after all? Now THERE’S a thought. Only if your understanding of Shakespeare’s text is superficial. The manner in which the Christian characters describe Shylock is so specific to anti-Judaic lore of the time that it doesn’t really work when transposed to another ethnic or religious group. Indeed, much of the the anti-Judaic lore that informs The Merchant of Venice continues to inform modern anti-Semitism– but bears no relation to any of the complaints leveled against Palestinians. I dunno but St George was. Keep that under your hat for a few days. Lyn Garner’s spiteful article about Habima is just what you’d expect from an anti-Zionist rag like the Guardian. I wonder if they have a notice in the Guardian offices saying “You don’t have to be anti-semitic to work here – but it helps”. It would certainly fit in with their corporate mission statement. Is there anyone at all at that nasty racist Guardian who is not a sick racist.Sour envious and miserable sods. But it was impossible not to think of other displaced people, too, most particularly the Palestinians. What Gardner meant was that she couldn’t help thinking of the Palestinians. She speaks only for herself. No, pretz, she was speaking for herself and the other idiots who think as she does, while trying to influence others who don’t already think the way she does. Get it? Hold your horses. What I meant was: speak for yourself, Lyn Gardner – because most people would not have the same reaction as her.